Many people look at the 2011-current Coyote 5.0 engine platforms as a complex and expensive engine to build. In reality, they are actually very cost effective and can be tailored from mild to wild with ease. Want to make 350 horsepower or 1,500+? No problem. In this article we are going to explain the different levels of Coyote engine building. We teamed up with a host of manufacturers and L&R Engines to build us a Coyote engine for road racing duty on Project BOSS 302Revival. No that’s not a typo. While most know that Coyote 5.0 engines come from a 2011-current Mustang, they are also found in F150 trucks and can be purchased at a bargain. Expect mileage to come in between 80,000-150,000 miles at that price. 80% of an F150 5.0 engine is the same as a Mustang and serves as a great core engine for a full build – just like what we are doing. The main differences are less aggressive camshafts, slightly lower compression (and less robust pistons), oiling system, and intake manifold. If the take-out engine is in good shape, these F150 5.0s can handle around 500-horsepower with a power adder. Expect naturally aspirated power numbers in the low to mid 300 horsepower range at the wheels. These low priced 5.0 engines can be found on eBay and Car-Part. When it comes to rebuilding a Coyote engine from a core, Summit Racing stocks a whole slew of OE replacement valvetrain parts, gaskets, and more. An F150 Coyote core is the cheapest way to go on a Coyote build. Utilizing the Mustang front cover will allow for an easier retrofit of accessories and supercharger bracketry. With this front cover, a new oil filter mounting boss is required. Both parts BR3Z-6019-G (plus front main seal AT4Z-6701-A) and BR3Z-6881-M can be purchased for around $150. A M-6600-A50PKIT includes a recommended gasket set. Equipping an F150 engine with a few ’11-14 GT pieces can be worth around 30-50 horsepower while also being very affordable. A GT intake manifold can be found for $100-200 and GT cams for $150-$300. Installing the camshafts will require removing the damper, front cover, and disassembling the front chain drive system. Don’t worry though, all the links are color coded and the motor doesn’t have to be degreed. During the service, we recommend installing a Mustang front cover and oil filter housing. There are some variances in the F150 counterparts and the new cover will aid in adding any power adders later. Both parts BR3Z-6019-G (plus front main seal AT4Z-6701-A) and BR3Z-6881-M can be purchased for around $150. A M-6600-A50PKIT includes a recommended gasket set. Billet oil pump gears is a safe bet, and we will get to those later. 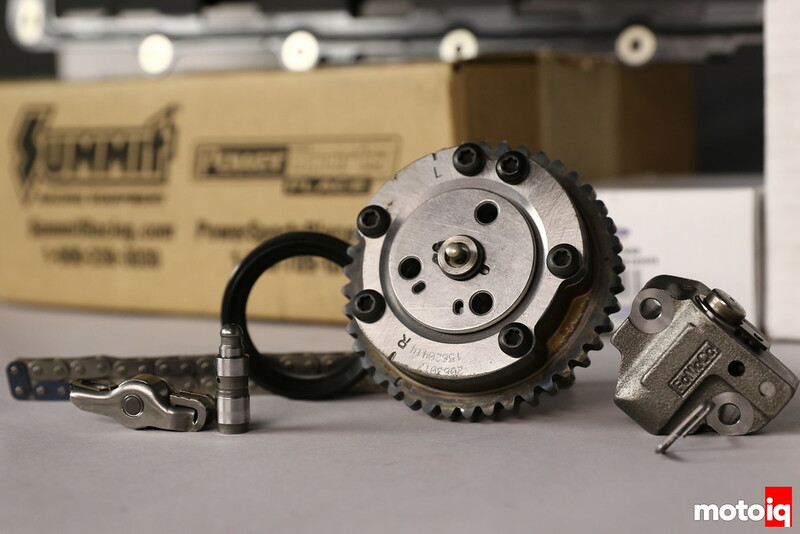 When working with a higher mileage engine where a camshaft change is going to be performed already, upgrading the valvetrain components is simple. Ford Performance makes a variety of kits that are offered from Summit Racing. These kits, come as a discount over purchasing the individual components, include new lash adjusters, roller finger followers, gaskets, phasers, and more. Once in the car, Coyotes aren’t the easiest to work on, so we suggest these upgrades in advance of an installation. Planning a big power build? There’s a myriad of upgrades that are available related to the front drive system. For our build, we teamed up with MMR to showcase their slew of Coyote components. Starting at the bottom are the oil pump gears and housing. 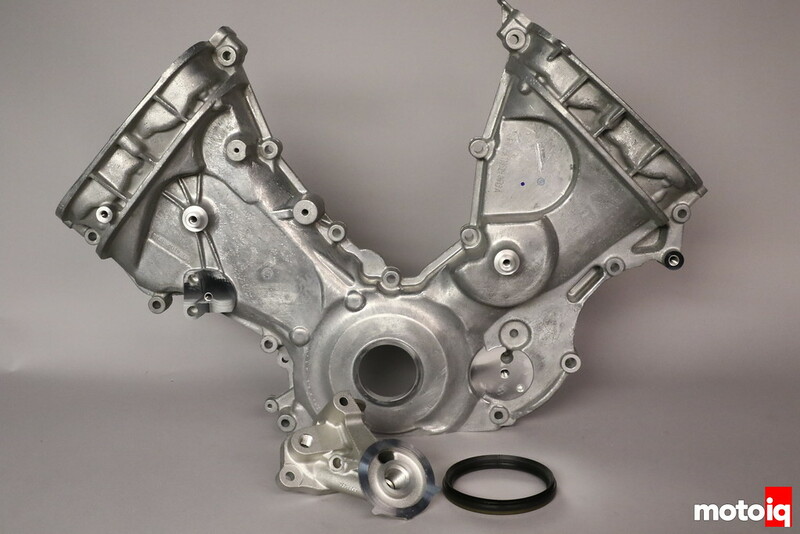 The F150 uses a different oil pump housing with powdered metal gears, though the Mustang also comes with powdered metal gears. These gears are known to fail on higher horsepower builds, especially when a supercharger is involved. Since we needed an oil pump, gears, and pickup tube, we opted for all three pieces from MMR. The housing starts life as a stock 5.0 and is ported. Inside is MMR’s billet steel gears that are bulletproof. Attached to the pump is MMR’s high-flow pickup that’s designed for Mustang-style pans. Coyote engines operate at 85-100 PSI of oil pressure at load, and the larger high-volume pickup assures the engine is getting all the oil it needs to survive. MMR even has a nifty oil pickup stand that is designed specifically for ARP main studs and provides a perfect pickup height. Tons of great information here, thanks for sharing! I’m looking forward to coyote swapping my 97 GT, just trying to figure out how much I really want to spend on the build, and this really helps!